Children of all ages are in for a magical treat when the popular 'Enchanted Christmas Kingdom' returns to Hatton Adventure World. Children can make a date with Father Christmas in his twinkling Grotto every weekend from 24 November - 23 December and weekdays from 17 - 21 December as well as Christmas Eve. Well behaved children will receive a Golden Key to unlock his workshop and then choose a present of their choice from the huge range of quality gifts in the secret toyshop. The all-day 'Festive Entertainment Package' also includes entry to The Christmas Magician with lots of marvellous magic from Zoobee, 'Cool Colin' and his interactive quiz, The Owl and the Orient King featuring breath-taking flying displays, festive Fun Fair Rides, 'Zoobee's Festive Friends Puppet show' which has plenty of mischievous Christmas capers and the Reindeer Quest where children have to find 9 lost reindeer to win a prize. New for this year is Gingerbread Decorating with Mrs Claus and the chance for children to make reindeer food to leave for Father Christmas and his reindeers on Christmas Eve. 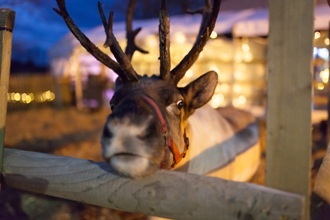 Plus there's Christmas in the Farmyard and Guinea Pig Village, Festive Scales & Tails, Christmas Carolling, Indoor Soft Play and Adventure Play. Carron Smith, Marketing Manager at Hatton said "Our Grotto is one of the most magical I've seen and so beautifully decorated with twinkling lights, snow and festive characters. We want to create special Christmas memoires for children. Seeing their faces light up when they see Father Christmas and his Elves is such a joy to see. With the 'All Day Festive Entertainment Package', Hatton has all the magical ingredients needed for a truly fairy-tale Christmas this year".